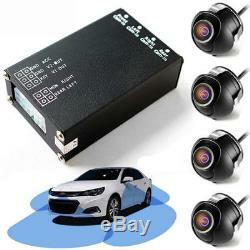 4 Camera Car Parking Kit Full View Front/Left/Right/ Rear Cam System Multiplexer. 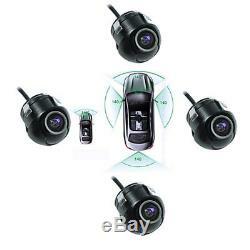 4PCS Rear View Back UP Cameras 360 View Car Camera Control Box 4 Way Cameras Switch System For Rear Left Right Size Front Camera. 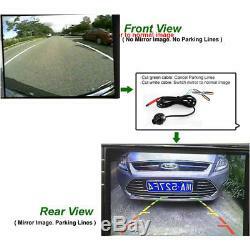 Video output: Two videos output, one for car monitor, the other for car DVR. Supplied by control box system. 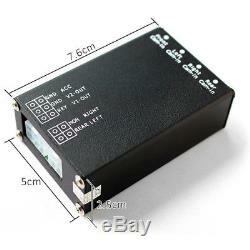 Supplied by control box system, or could be supplied. 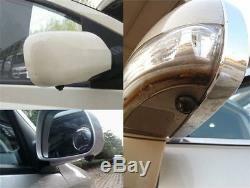 Left/Right side view camera power: supplied by control box system. Automatical round view when starting. 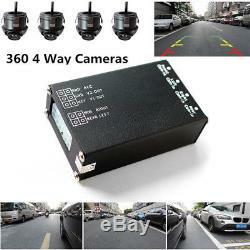 When car engine starts, the system will activate the car monitor and the all the camera around one by one to check the view around for 10 seconds, then turn off. When you pull the reverse gear (Left/Right turning no triggered), the system will activate the monitor and rear view camera till the reverse gear back, then switches to front view camera for 10 seconds then shut off. The system start with front view mode as default. Front view controlled by switch(included). 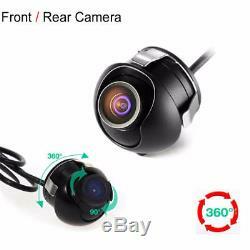 Press the control switch for 2 seconds, car monitor and car front view camera will be working all the time, if no other trigger working. 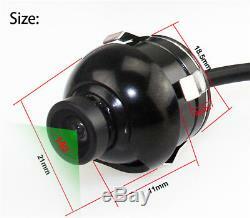 And then you could shut off the front view video by re-press the control switch for 2 seconds. Press the control switch less than 1 second to enter Side View Mode. When you turn on the turning switch, this system will activate Monitor and Side view camera (Left/Right side view camera is controlled by Left/Right steering lamp). 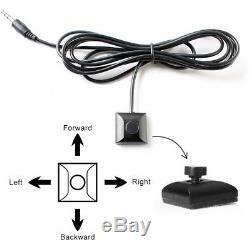 The monitor and camera will turn off after 1.5 seconds when steer turning is finished. Press the control switch less than 1 second again to enter Front View Mode. Right View>Left View>Back View>Front View. Press for less than 1 second: Side View mode / Front View mode. Press for 2seconds (in Front mode): Front View always working / Front View turn off. The system working current: Max: 50MA. (Excludes working current of cameras). The system working power: 9-30V. 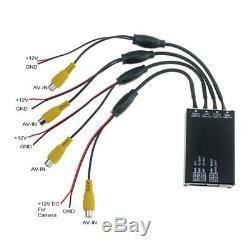 (Power supply to cameras is the same as the system input voltage, in 24V vehicle, please use 24V cameras). Image Sensor: PC1099 Optical Size: 1/3 inch Pixel pitch: 5.07.4um Effective Pixel: 720480 Horizontal Resolution: 580 TV Lines Dynamic Range: >72dB S/N Ratio: >48dB Min. 4 x Camera(Front, Rear, Left, Right). 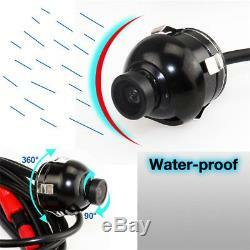 4 x Camera Extension Cord. All items will be checked before packing. All items are new and of high quality. We will reply you within 24 - 48 hours due to time difference. 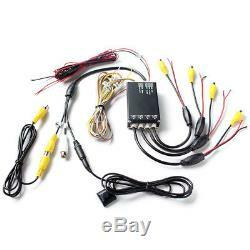 The item "4 Camera Car Parking Kit Full View Front/Left/Right/ Rear Cam System Multiplexer" is in sale since Thursday, March 15, 2018.